Butterworth suggests that about 4% of the population may “have dyscalculia”. Looking at the bigger picture, it is clear to anyone working with maths education that a far larger proportion of the population struggle with aspects of Maths, and do not thrive on the traditional approach. I prefer to see “number blindness” as a spectrum, on which some people are extremely fluent and comfortable with number, to the extent that they seem truly gifted, others struggle painfully, and the majority are somewhere in between, often feeling that they are worse than average, even if they in fact are right in the middle. I start work with every student assuming that they are “number-blind” until I see evidence to the contrary. This helps me to remember that, compared with a Maths teacher, most people are relatively number-blind. Unless you immerse yourself in number as much as a teacher probably has, you may not recognise high powers of two, multiples of large primes like 17, etc etc. Many Dyslexics struggle with Maths, perhaps because of the extremely complicated processes required to carry out the high-end of arithmetic operations, such as pen and paper division. I am privileged to have worked with a handful of severely dyslexic students, who were very articulate about their learning styles and helped me to experiment with how to express Mathematical reasoning in a way that they could make sense of. Poustie indicates that individuals may well be experiencing some degree of Dyslexia and Dyscalculia, together. Labels such as Dyslexia and Dyscalculia are only helpful if you have some strategies for coping with them, and I tend to focus on the learner, the Maths, and the strategies, and not worry too much about labels. I welcome feedback, please use the reply box. I have ordered the builders’ angle measurer that we looked at online and chatted to the plumbers who are in my house today who don’t use one of those but thought it sounded incredibly useful! Link to the online game of measuring angles on screen…. Brilliant “make an angle game” that we played, and you were so good at! The link takes you to the start screen – we skipped the intro then chose “make the angles game”. 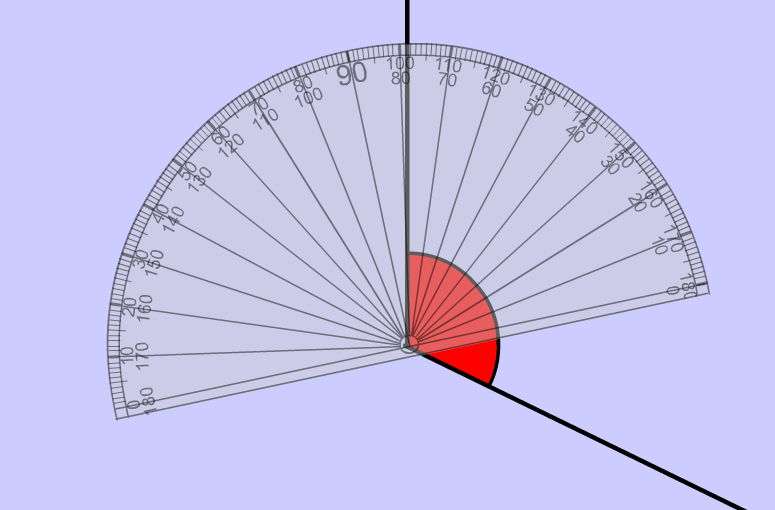 To practice full-on measuring, where you have to place the protractor without any help from the computer, the option to pick is “up to 180 degrees in ones”. Build your own printable worksheet (to use with a real protractor) – gave you one to do, here is a link to it just in case, feel free to make some more worksheets if you want more practice. I wonder how you will get on, measuring angles over 180 degrees, when your own protractor only goes up to 180…. It’s a genuine mathematical problem, and I think that if you give it 5 minutes of careful thought, you may come up with something. It isn’t impossible, but it isn’t obvious either. As always, if you can figure out your own solution, you are MUCH more likely to remember it! If your mind goes a blank when you try to use your 180 degree protractor, I would recommend this video because the teacher is making an effort to not be boring, is quite funny, but rather quiet, so you’ll have to listen carefully! You are making great progress with algebra, I think. The crucial link between the written symbols and what they actually MEAN is not easy to make, but you are putting the hours of practice that you need, in order to become confident. Here are some more questions. I know we discussed the idea that I could build an interactive game for you that would check each piece of your working, and your answers, but on reflection, I think you are getting sufficiently fluent with algebra now, that this level of feedback would actually be unhelpful, like bolting stabilizers back onto a bicycle after you have begun to balance it by yourself. You are already in the (excellent) habit of keying the question into your calculator, keying in the answer, and comparing the two, What I would like you to focus on this week, is actually writing down the “easy version” and, if the question and answer DON’T match, then key in these workings out as well to narrow down the problem. The huge advantage of you and the calculator (rather than the computer) doing the checking, is that you are able to use your calculator throughout the IGCSE exam, so you are practicing really useful skills, not using a tool that will be taken away from you. After working on the last worksheet with you, we both realised that the sums were too densely packed on the page, and a bit dazzly. I hope this version is easier. 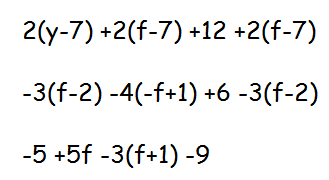 I have left gaps for you to write the “easy version” out directly below the sum. You made more errors when you did everything mentally, and fewer when you jotted the “easy version” as a working step. Jargon-wise, what we are doing is called “multiplying out brackets and simplifying”. That’s the terms the examiner would use (instead of “writing down the easy version and writing down the answer”.